When I know Brother Brant is putting out a new disc I get a bit giddy, whether it’s instrumentally heavy (Jalamanta) or his 70s groove sound fused with an 80s new wave feel (the Operators/and the Bros) it’s pure ear candy to these hungry ears. Everything that BB has been a part of I’ve loved; be it the masters of fuzz, Fu Manchu, Desert rock pioneers Kyuss, or Vista Chino...and of course the list goes on. Bjork has released a ridiculous amount of albums since his debut solo album 17 years ago. And like with any band, I like some albums more than others. The last two BB albums in particular, though I still love them, have been my least favorite, mostly to do with some of the production and his vocals sounding a little different--a bit rougher--than earlier stuff. But with Tao of the Devil he’s back to form and filled with 70s hard rock venom. Normally I don’t break down each song but we’re talking Brother Brant here and sometimes you’re not sure exactly what kind of groove you’re getting, and well...I just love BB enough to do that. The Gree Heen - Right off the bat the album starts out pretty bluesy, the guitar and vocals preaching together in harmony, ultimately leading into full-on Sabbathy doom. There’s even the obligatory bouncy Sabbath breakdown half way through the song. BB was clearly channeling Iommi in this tune. Humble Pie - We all know how BB digs the 70s rock, and he shares that love with us album after album, but this particular song is probably the most undeniably straight up dirty 70s hard rock that he’s given us. Blue Cheer meets James Gang meets Grandfunk Railroad and a dash of Big Brother & the Holding Company...yup, this one is raw and gritty. Stackt - Heavy, heavy groove with some of that same guitar lead/vocal harmony thing going on. And as though Brant himself were on the drums, the cymbals are beaten mercilessly and the high hat open just like his days in the Fu. This is one of the songs that holds a bit more raw production on Brant’s voice, something he started doing on Gods and Goddesses and more so in Black Flower Power; it’s not horrible, and in this song I'd say it's even needed. But I do prefer that nice clean, overdubbed vocals on his earlier albums. Luvin’ - This song screams old KISS...just wait until them vocals kick in and you’ll feel it too. Brant’s vocals are back to that overdubbed Frehley-esque sound that he’s blessed us with on so many of the other albums. The chorus reeks of straight up 70s rock and roll. Biker No. 2 - What can I say but more groove rock, though I will admit this is the weakest link on the record for me. Dave’s War - That bouncing Sabbath riffage with Brant doing his newer growl (reminds me a bit of Gene Simmons when he does it). This is an exceptionally catchy tune that’ll have you singing the chorus (and pre-chorus) while tapping your foot. Approaching the midway mark, the tune slows down into a spacey groove that holds the power to sway your head involuntarily. Tao of the Devil - A brooding and tribal lazy jam that keeps the same tempo throughout. Evening Jam (bonus track)- A lengthy instrumental that starts out with some Hendrix-esque wah that ultimately erupts into a full-on head-boppin’ upbeat groove then drops into of a more slow bluesy pace, things progress, then drop down again into spacey and atmospheric followed by more progression once again...there’s plenty enough room for this roller coaster of tempo and moods within this 14-minute jam. Because I purchased the limited fanboy vinyl box set I figured I’d say a few words about the goods that came in it. I paid $49 for the package and it was a steal for sure. A turntable mat, the album both on CD and gatefold clear vinyl, as well as a nice sized poster and bonus clear vinyl with re-recordings of Lazy Bones/Automatic Fantastic and Freaks of Nature (without the usual chorus), and it all came in a beautiful black box with the album cover artwork on the front. I wasn’t sure how I’d feel about the re-recordings of these older songs but they sound killer. He could have snuck them on the regular disc, taking up half the room on the album but offered them as a bonus instead. I dig that. Overall, Tao of the Devil is pure gold and consistent with what the man continues to bring: Organic rock with roots planted firmly in the 1970s. The only surprise here is how many solo albums BB has put out in the past 17 years. 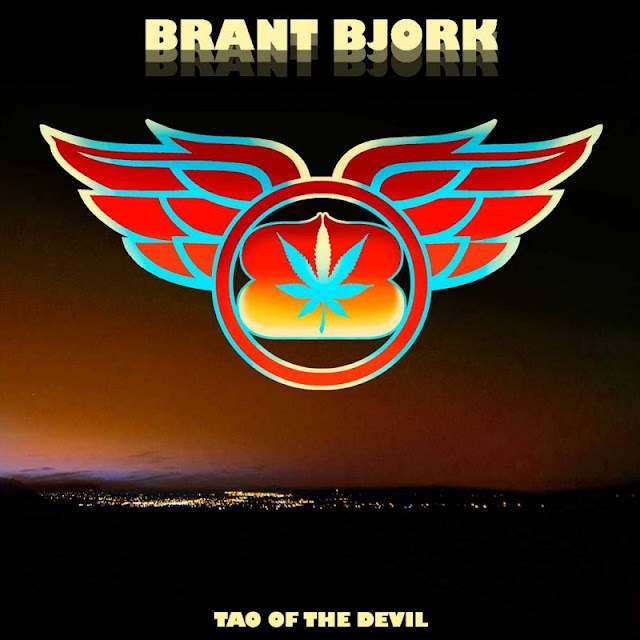 I can confidently say that if you’re any kind of fan of Brant Bjork at all then you’re going to be very pleased with Tao of the Devil. Right on, this some good and heavy 70's groove rock. Brant lays it all down with some raw, but polished production. Great song writing and the rest of band plays their asses off. I'm sure Brant recorded more songs, so let's hope they put those out. Great Blog for some of us heavy metal lovers. I found it difficult to read, its to dark but your articles are short and very easy to read at the same time. I love that you can listen to the music while reading about it, no need for youtube etc. In my opinion the whole look of its quite dull, BLACK and WHITE articles usually make the funs skip the page. With that being said, what colors would you suggest?